Mangaluru, Feb 09, 2019: In the wake of successful ‘River Fest’ and activities, business people have come forward to start cruise restaurant and water sports at Phalguni River, which flags off the beginning in DK district of new long awaited tourism ventures. In first phase, two institutions have already shown interest to start cruise restaurant and water sports on Phalguni River and accordingly, the DK district administration has given permission for a period of 5 years. What is worth noting is that, the success of the River Fest, has caused even more institutions to show their interest to start tourism related activities here. Hence, the new beginning of water tourism in the district is a new look. Four organisations have requested permission to start water sports from Kuloor to Tannirbavi along the Phalguni River. The DK DC who is also the president of the district tourism development committee has given permission, applicable from Jan 1, for the next 5 years to 2024. the entities are, Netrani Snorkeling Adventure of Murdeshwar and Wonder Splash of Mangaluru. Out of the two, Wonder Splash has also received the permission to start a Cruise restaurant at Phalguni River. With the aim to provide encouragement to water tourism, the first year will be considered as a provisional year and the organizers will not be charged annual license fee. After one year, taking into consideration the progress, the fee amount will be decided by the committee. Water sport activities : Water sports can be conducted within a limit of 1 km of Phalguni River from Kuloor to the memorial for the victims of the airplane crash which is in Tannirbavi. It has been aimed to provide a variety of water sports facilities including speedboat, Jet Ski, banana and bumpy ride, fly fish, pedal boat, kayak, inflatable towable, sleeper bumper and snorkeling. Wonder splash already has 30 years experience in tourism activities through its ventures at Goa and Karwar. Floating craft : On the occasion of the River Fest in Mangaluru, along with speedboats, jet skis, ferry boats, 30 different boats had been used. Netrani Snorkeling Adventure is already involved in water sports activities at Murdeshwar and Malpe. It had organised the water sports during the river festival. This time it will be starting to give regular water sports facilities near Kuloor along the Phalguni river. 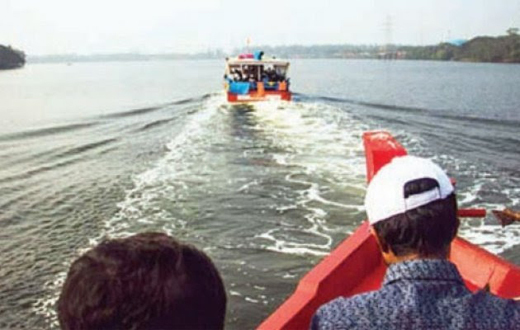 In order to develop water tourism along phalguni river upto Tannirbavi, a proposal for various plans for the development of the basic infrastructure through the union government’s Swadesh Darshan Tourism at the cost of Rs 5 crore has already been sent to the central government. Also a Rs 4.83 crore proposal has been sent regarding the development of the river shore at Sasihitlu. The proposal includes landscaping, construction of path way, pedestrian track, water purification unit, temporary resting room, Kuloor bridge, Sultan Battery and the construction of Kuloor Bengre jetty. The district tourism development committee has submitted a proposal to the state government during the preliminary budget meeting, demanding grant for the creation of jetties. All said and done this project is seen as a good omen for water sports in DK.